You fancied a pide, you went to Paşa Kebap. You wanted lahmacun, you went to Paşa Kebap. You wanted a takeaway – or even delivery service – you went to Paşa Kebap. This was back in the late ’90s. A time when eateries in Fethiye weren’t nearly as abundant as they are now and what we had were just a few local, tasty stalwarts. Paşa Kebap in Fethiye was one of those places. There were other places, too. Köfteci İmadettin, we didn’t even know about at the time. There was a great lokanta called Sedir that all of us loved. Meğri Lokanta was across the road from where it is now and served various soups 24 hours a day. Many is the time we’ve sat in there at some silly hour of the morning after a night out in Paspatur. And, if you wanted a quality döner dürüm, you knew to go to Yengen. Paşa Kebap was part of that crew. So why has it taken us along to write a blog post about this old favourite? Pre blog days, we were there a lot. And then, at some point, new places started to open so we gave them a try. The ‘favourite eateries list,’ started to grow. We went back to Paşa Kebap a couple of times and there were changes to the menu (no doubt adapating to keep up with the competition), and some of our favourite dishes had changed…and for us, they weren’t quite as good as they used to be. By and by, Paşa Kebap just slipped from our radar, really. This was the early to mid-2000s. And then the world of social media was thrust upon us and people started to follow and like anything and everything to do with their favourite things in life. Fethiye was one of those ‘favourite things in life’ for us so we followed pages and people to do with Fethiye. Paşa Kebap was very definitely back on the radar whether we were paying attention to it or not! Recently, we decided to treat ourselves and go out for lunch. The first arrivals of the summer season were around for the British Easter holidays, the weather was pleasant and sunny; we decided to have a long weekend, too. Ahh, lovely. It was a happy feeling to be sat under the shade of those trees again after so long. Yeah, you’re on the main road but that’s forgiven with Paşa Kebap. It’s a local kebab/pide joint, not a luxury restaurant. 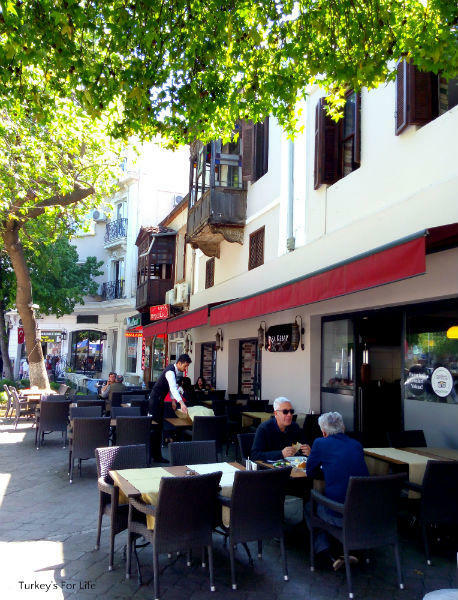 Of course, the place has been smartened up a tad over the years – you wouldn’t expect anything less from such an established face on the Fethiye eateries scene. As we hadn’t been for so long, I took myself off to use the facilities…and have a little look around in the process. 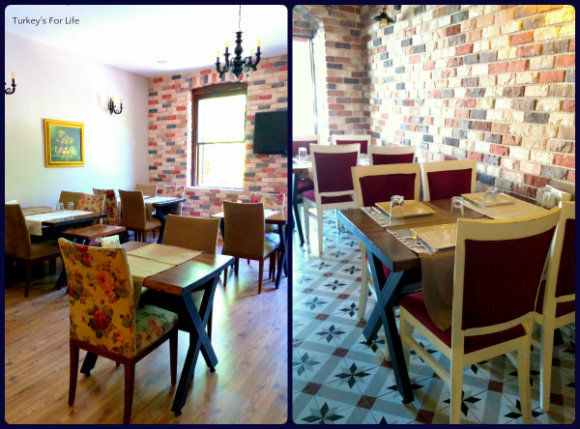 It’s still very relaxed in Paşa Kebap – a hint of more formalisation but nothing over the top. You still feel like you’re in a place serving up good traditional meals without the unnecessary airs and graces. Open, busy kitchen, clanking of plates and utensils, take away services being carried out to the surrounding businesses. So, time to eat, then. We looked through the Paşa Kebap menu. Of course it’s changed again since we were last there and there was lots to tempt. All still familiar Turkish fare and, as it was lunchtime, we decided against meze and we’d just go straight in for the main meal. Food and drinks ordered, we sat back and waited to see what would be served. Oh, don’t you just love those restaurants where you’re given a small selection of meze dishes as part of your meal, anyway? It’s quite common in Turkey but still a happy bonus. Homemade – and warm – fresh buns and a serving of butter. A pepper and onion salad dip that we’ve never had before so its name remains unknown – should’ve asked the waiter. Tulum cheese and walnuts and some good old haydari. The big bowl of salad was one of the tastiest we’ve had. Simple roughly shopped flat leaf parsley, sliced red onion and red cabbage. Aside from the fact that these are three ingredients we love, anyway, what made it so special was the dressing. The cabbage and onion must have been marinated in the dressing for quite some time as they were almost glazed. Olive oil and nar ekşisi were definitely in there. Just the right amount of nar ekşisi, too. We polished that off way before the meal arrived! And then it was time our meals. On the way to Paşa Kebap, as we walked along the harbour, Barry was really fancying Iskender Kebabı but then we remembered back to those past days. You could only get döner meat at Paşa Kebap in the summer months. Things have changed, however, and the spit is now in action, year round. 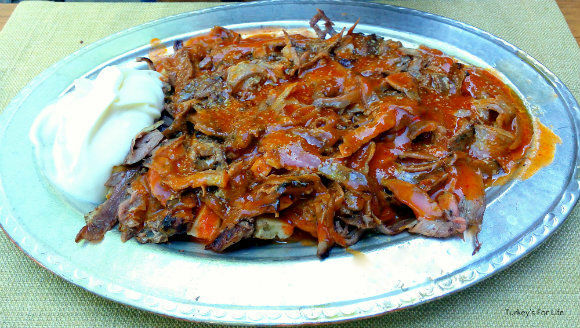 In action or not, a good Iskender Kebabı needs quality meat. No point ordering one if you look at the meat on the spit and it just looks like a big unappetising hunk of brown cereal mix and who knows what else. No fear here, though. We could see each layer of meat stacked onto the spit and when the Iskender came, it was tasty slices of charred and tender meat; not slithers. The tomato sauce was tangy without being too rich and there were oodles of bite-sized chunks of pide bread which made a bed for the whole thing. A very generous portion. The only thing that wasn’t there was a charred green pepper. Not the end of the world. Meat quality is the key, here, and it was thumbs up from Barry. Why, on a hot day would you choose Arap Kebabı, served on a non-cooling hot skillet so that your meal continues to simmer and bubble whilst you’re eating it? Well, that’s my logic – or lack of. This was my sunny afternoon lunch and very tasty it was, too…once I’d eaten it. We were there some time whilst I slowly worked my way through it. When I’ve had Arap Kababı in the past, it’s been with minced meat. At Paşa Kebap, you’ve got a choice of three; meat, chicken or vegetable. I went for the meat option and, rather than minced meat, it was little tender chunks. More like a Mediterranean stew with roughly chopped potato, aubergine, red and green peppers and tomato. I usually put ample sprinklings of whatever herby, spicy condiments are on the table, all over my meals. This didn’t need any of that. Paşa Kebap is on Çarşı Caddesi; the main shopping street in Fethiye. There is indoor and outdoor seating as the restaurant is open year round. Beer and wine is served as well as soft drinks and hot drinks. Paşa Kebap is moderately priced and the portions are generous. If you’re in town, take a look at our Fethiye area bars and restaurants page for ideas of where to eat and drink. Paşa Kebap is included in this list. Dürüm At Mozaik Bahçe In Fethiye – What Took Us So Long? The paşa kebap seems to be lots of people’s favourite. 🙂 Not big fans of cheese toppings sometimes but might give it a try one day. 🙂 Thanks a lot for your comment.